Peter J. Heslin, Propertius, Greek Myth, and Virgil. Rivalry, Allegory, and Polemic, Oxford, 2018. This volume offers a strikingly innovative account of Propertius' relationship with Virgil, positing a keen rivalry between two of the greatest poets of Latin literature, contemporaries within the circle of Maecenas. It begins by examining all of the references to Greek mythology in Propertius' first book; these passages emerge as strongly intertextual in nature, providing a way for the poet to situate himself with respect to his predecessors, both Greek and Roman. More specifically, myth is also the medium of a sustained polemic with Virgil's Eclogues, published only a few years earlier. 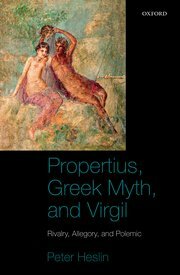 Virgil's response can be traced in the Georgics, and subsequently, in his second and third books, Propertius continued to use mythology and its relationship to contemporary events as a vehicle for literary polemic. This volume argues that their competition can be seen as exemplifying a revised model for how the poets within Maecenas' circle interacted and engaged with each other's work - a model based on rivalry rather than ideological adhesion or subversion - while also painting a revealing picture of how Virgil was viewed by a contemporary in the days before his death had canonized his work as an instant classic. In particular, its novel interpretation offers us a new understanding of Propertius, one of the foundational figures in Western love poetry, and how his frequent references to other poets, especially Gallus and Ennius, take on new meanings when interpreted as responses to Virgil's changing career.